Blockchain technology is like the first printing press, with Bitcoins being comparable to the Gutenberg Bible: the first book printed on a large scale, decentralizing literacy and theological knowledge; it was a wondrous accomplishment. But blockchains, as with the printing press, can have many more applications. In terms of digital currency, for people in Africa, Asia, and Latin America, that could mean less service fees in remittance, a more secure and transparent form of “smart” contracts, and a reliable way of storing or transmitting value. Satoshi Nakamoto, an enigmatic programmer, released the first Bitcoin in 2009, as an open sourced, decentralized digital currency. Today, the Bitcoin “mining” process creates 25 Bitcoins every ten minutes. As of May 2016, there are 16 million Bitcoins in circulation, of a capped total of 21 million. Each Bitcoin consists of two parts: a Public Key (an “address”), in the form of 34 characters starting with a 1 or 3 that represents a possible destination for payment; and a Private Key, in the form of 51 characters staring with a 5, which is required to transfer value from the address. Blockchains, decentralized public ledgers with cryptographic rights ascribed, are used as the vehicle to transmit this digital value. According to one Tech Salon participant, there are about 500 varieties of digital coins, some are scams and some have financial promise. As with most investments, it’s the user’s responsibility to research the legitimacy of the coins. Overall, Bitcoin is backed by its ease of use, by sending digital currency at transaction fees of four cents; making it valuable, fungible, and visible to users. Currently priced at $456, Bitcoins float against the dollar but has huge swings in value. In the context of international development, blockchains can facilitate trade or jumpstart infrastructure. Although we have regulated banks in the West, there are other countries lacking this level of quality, which makes financial transactions or proving ownership of property less secure. However, transactions on the blockchain are verified by a decentralized network of nodes, and in order to support the network and earn/mine a Bitcoin, mining computers first need to verify all the previous transactions on the blockchain before competing to solve the next cryptographic solution for the next block of Bitcoins. It’s similar to buying land in the U.S. An attorney needs to first verify the chain of title to the property by researching transactions in the county clerks office. They inspect the deeds to look at the grantee and grantor, verifying that no third party has a claim to ownership in the property. This verification occurs every time the land is sold again, and ensures the property owners and any lenders have clear rights to own or encumber the property with a lien. Blockchains are like the title assessors; they validate transactions back to the very beginning. Blockchains can’t be broken in terms of validating ownership. And that’s a big deal in developing countries with corruption, missing records, and less secure financial institutions. How Can We Use Them in Development? With the public/private key pair, explained earlier, two people in a developing country could use blockchains to sign a public “smart” contract or invoice. They can prove ownership. It’s hyper-efficient, especially since a “bad guy” can’t change its digitally signed-in public ledger. For development agents, they have questions about how blockchains would best be implemented, how it would augment supply chains, or improve transparency. During the Technology Salon, a representative from a digital financial services company specializing in cryptocurrency noted how Somalis in Minnesota were using Bitcoins to send remittance to their homeland. 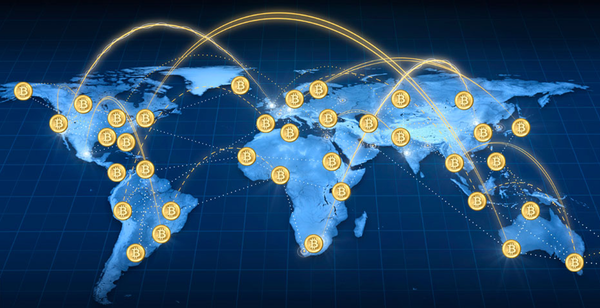 While workers abroad may use remittance services like WorldRemit, TransferWise, and Xoom, Bitcoins are an alterative that saves more money. In Nigeria alone, $22 million was sent as remittance by traditional means, but $2 million was paid in fees. But with blockchains, transportation costs are lower – saving money for those with little of it. At the same time, blockchains have a greater impact on smaller transactions; a remittance of $50 would have fees of 1% or 2% for the processors turning those digital transactions into cash. The Inter-American Development Bank has had discussions with governments about policy change relevant to digital finance, and a few are curious about it. Policy-makers may support the idea when a good blockchain application is established. But a few thought experts, within the Tech Salon, don’t believe financial institutions would support blockchains because the chains are disruptive by nature; with a chain, they don’t know who the money is going to, and with no clarification around the regulations, this frightens banks. Ultimately, the development community will be the enabler to blockchain proliferation, collaborating with private sector companies, and not the initiator. Pilot projects can be created in Nigeria or India, and people will respond. Outside the United States, those hungry for digital finance will step forward. USAID is aware of this applicability and has a digital finance team focused on increasing access to financial services in the developing world. And within the World Bank, there are champions advocating about how blockchain tech can be applied to development initiatives. However, there will always be institutions preferring a regulatory framework for its usage (which runs contrary to blockchain’s anonymity and decentralization), and technological and cultural obstacles will also exist. Incumbent competitors, like traditional banks and Western Union, have tried to deter its growth. Blockchains represent an opportunity that “democratizes value, but can never be democratic” in and of itself, a point made by one Salon participant. One person noted the nature of remittance in Bangladesh. It’s the eighth largest country in the world, with two-thirds of the population unbanked. Many have never touched a phone; they aren’t tech literate. And for those receiving mobile money, many don’t understand the concept of identification and security, with some cases of entire communities using the same password because it’s easier to remember. Who’s responsible for educating them, before they ride this digital Zeitgeist? There are gender-based issues as well. In many Bangladeshi households, the husband uses the mobile phone. If money is issued over the phone to a wife, it may go to the husband, instead. Even among the technological elite, there is a smaller elite that actually understands and uses blockchain technology. For example, only one third of the Bitcoin Tech Salon participants actually own Bitcoins. Bitcoin and blockchains may offer freedom to the tech elite, but for most, it is still a nascent technology. By Corey Quinlan Taylor a freelance writer and editor.